Okay, okay – don’t get excited. Posts will be, as ever, sporadic, and I hope consecutive daily posts like these aren’t implied as a promise I likely won’t keep. But it probably does make some sense to check in while I’m still in the early stages of a new book, if for no other reason than to offer up some first impressions and capture the process of immersing myself in a new story. And I’m a sucker for immersion, especially when it comes via unconventional means. I scoff – scoff, I say – at books that get too self-consciously arty, but I love it when an author can pull off a genuinely immersive experience in a way that pushes the boundaries of what a novel can be. Mark Z. Danielewski’s House of Leaves is brilliant in the way it plays with shifts in genre, font, and the placement of words on page to create one of the creepiest reading experiences I’ve ever had. On the other hand, I found David Foster Wallace’s Infinite Jest and its plethora of footnotes to be annoying and cumbersome. I could easily put up with rotating Danielewski’s book upside-down to read certain pages – and flipping back and forth to read boxes of text that appear as mirror images from page to page – but Infinite Jest just made me grumpy. So it’s a fine line (and one which Danielewski’s second book, Only Revolutions, will test when I get around to the “D”s. More on that when I get there). 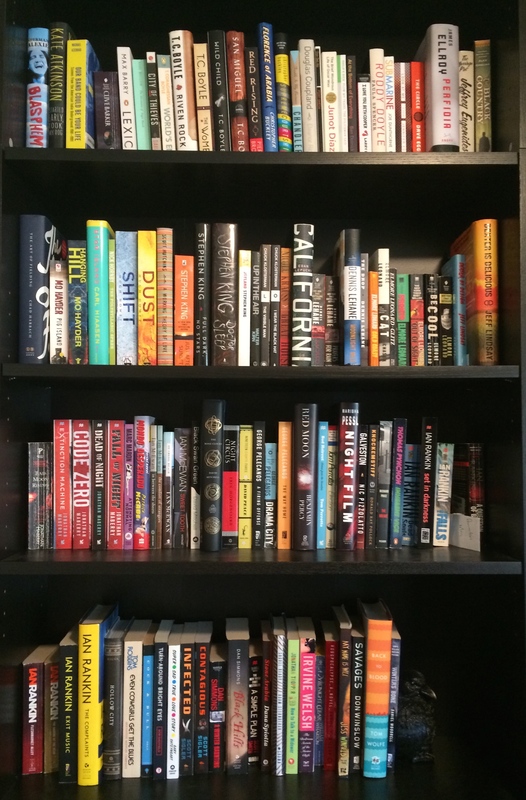 As much as I liked the idea of J.J. Abrams and Doug Dorst’s S. – the first “A” book on my top shelf – I admit that it made me apprehensive. The photo at the top gives you just a hint of what the reader is in for. At first glance it looks like a library book, complete with interlibrary loan stamp and due dates printed on the inside back cover. Open it carelessly and various documents flutter from its pages – memos, newspaper clippings, postcards, an old decoder wheel. And a cursory flip through the opening chapter lets you know that you’re in for a reading experience unlike any you’ve ever had – and one that will likely be more than a little labor-intensive. But that’s where the immersion comes in, see? Because S. plunges you into at least two (and arguably three) levels of story, which you can start to see from the provided images. The primary text is a bogus novel called Ship of Theseus that’s ostensibly written by a (bogus) guy named V.M. Straka. I’m only sixty pages in, but so far it appears to be a sort of quasi-Pynchon mystery that centers on a guy with amnesia trying to figure out who he is, how he lost his memory, and why everything feels like a conspiracy. It’s passably entertaining, but the more fascinating narrative – and I suppose we could argue that this is actually the primary text – is the one that happens in the margins between Jen, an undergraduate lit. major on the cusp of graduation, and Eric, a scandal-plagued grad student. So, on the one hand you’re reading Straka’s Ship of Theseus, but the heart of the story is the complementary mystery raging in the margins between Jen’s blue cursive and Eric’s black printing. Because Straka, as it turns out, is a Salinger-esque figure whose identity has perpetually been in doubt. Eric’s dissertation was going to be on unraveling the Straka mystery until he fell afoul of his apparently duplicitous and underhanded faculty advisor who pulled his funding and got him booted from the university. 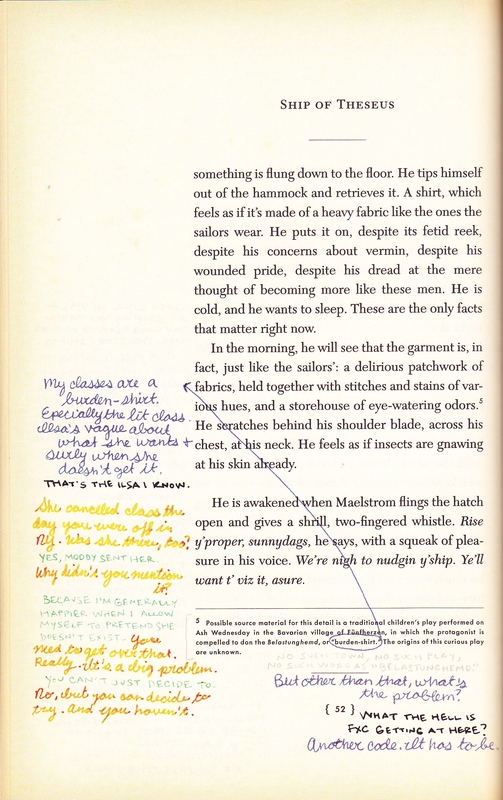 So now Jen and Eric (who have never met, at least not as far as I’ve read) compare notes, decipher codes, and try to solve the mystery, all through the marginalia they leave for each other in a library copy of Ship of Theseus. It is, so far, delicious. The ongoing conversation between Jen and Eric is sort of brilliant in the way it balances amateur sleuthing, university intrigue, conspiracy theories, mild coming-of-age angst, and flirtatious banter – all in comments made in reaction to another text. 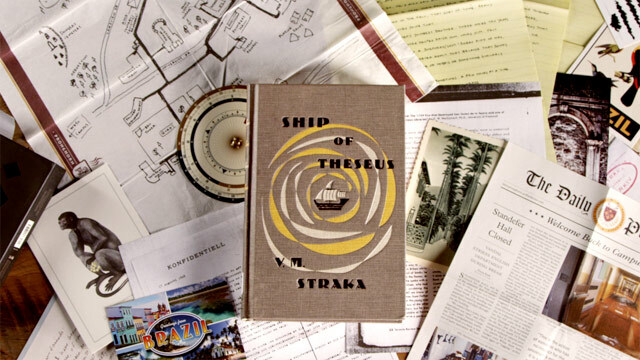 So Ship of Theseus has to work as A) a standalone narrative, B) a vehicle for the central mystery, and C) a way for Jen and Eric to develop as characters. And then there’s this. In the image to the right you’ll see that there’s some red and green notes that stand out in stark contrast to the customary blue and black. These notes appear sporadically, and it took me a few of them to figure this out, but the red and green comments were apparently written by Jen and Eric at some point in the future, reflecting back on the process by which they initially worked their way through the mystery. This adds an extra layer of complexity to the novel –the third level of story I mentioned earlier – as Jen and Eric’s commentary simultaneously exists in the present (the blue and black ink comments that attempt to puzzle out Straka’s identity at the same time as the reader), the future (the green and red comments that allude to events that haven’t happened at the time the blue and black notes were written), and the past (the green and red notes that comment on blue and black notes that have already happened). 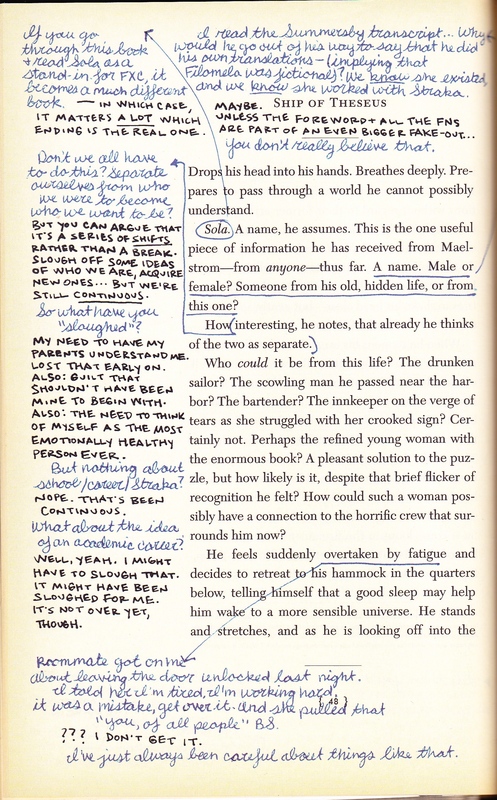 There’s also some periodic notes in another pen entirely – which I guess we can call faded ballpoint – that represent Eric’s grad student observations of the text (symbolism, allusions, etc.). Make that story level 3a. And, as I mentioned at the top, there’s also the various other documents crammed in Ship of Theseus‘ pages, like this newspaper spread that alludes to one of the reasons why Eric was expelled from the university. On second thought, I shouldn’t have been so hesitant in my language earlier: it is brilliant. Sixty pages in, and I’m officially hooked.